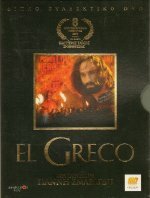 After director Yannis Smaragdis completed Kavafis in 1997, he announced that his next picture would be about Domenikos Theotokopoulos, better known as El Greco, and that Vangelis would do the score. This initially led to a lot of speculation. Would this be a new score or simply the use of Vangelis' "El Greco" releases from 1995 and 1998? And then with the passage of time, this "rumour" about a new movie and Vangelis score was dismissed and forgot about. Not by Mr. Smaragdis. He spent the next ten years working on raising the money to complete his vision, and in 2007, his vision made it to the big screen. A smashing success in Greece, the film has now been released in the theaters of Spain and it appears that the international rights have also been bought, so perhaps it will finally appear in other European countries, the US and who else knows where! In the meantime, the DVD has been released in Greece and if you have a multisystem DVD player, you won't need to wait until your local theater is showing it! The film is beautifully made. I enjoyed this over the Mel Ferrer film from the 1960s, although there are some similarities between the two films. Of course, the Vangelis score is exceptional, and not at all a re-use of his 1995/1998 "El Greco" albums! All new music was composed for this film, and there is nothing like seeing credits for a film set to Vangelis music. Finding this is not difficult, as it is easily found on ebay. 2008, 2 DVD Edition, Dolby 5.1 and DTS, 16:9, Region 2, PAL, in English and Greek (no English subtitles), second DVD includes a "Making Of" documentary plus several other extras. In slipcase.